Two great social and political realities dominated Paul’s world: the Roman empire and Greek culture. Every event in the New Testament took place within the Roman Empire. In Paul’s day, the Romans had controlled the Mediterranean region for about a century. For the most part, this was a blessing for the spread of Christianity. The Romans had established peace and security within their borders and had made travel generally safe and predictable. Roads had been built, and piracy, banditry, and harassment by local rulers had been curtailed. One could move freely throughout the Roman world. The world of the New Testament was also dominated by Greek culture. As Greek culture had spread, in many places the Greek language had supplanted the local languages; elsewhere, people were bilingual. This meant that almost everywhere Paul went, he could talk with the local people in Greek, the international language of that part of the world. It also meant that he encountered a fairly standard world view and many common customs and beliefs. Most of Paul’s ministry took place in cities. Some of these, such as Rome and Antioch, were among the largest in the world. Others, such as Derbe and Beroea, were smaller. Despite differences in size, location, and topography, cities in the Roman world shared some common features﻿—such as a theater, public baths and fountains, temples, and an agora (a rectangular market area surrounded by colonnaded shops, shrines, and public buildings). Many cities also had a Jewish synagogue. Paul would typically begin his preaching at the synagogue and then take the message of salvation to the Gentiles. Saul of Tarsus, later known as Paul, was nearing Damascus when the Lord appeared to him, saying, “Saul, Saul, why persecutest thou me? … I am Jesus whom thou persecutest.” Saul’s response characterized his commitment to obeying the Lord’s will from that moment to the end of his life: “What wilt thou have me to do?” When he was brought blind into the city, he stayed in a house on “the street which is called Straight,” a major east-west thoroughfare of the city. There he later had his sight restored by a priesthood blessing. He was baptized in Damascus and began his ministry, preaching to the Jews of the city. Today Damascus is the sprawling capital of the Syrian Arab Republic, with a population of more than one million. Its Old City, the Roman city that Paul knew, is now known mostly for its beautiful Islamic mosques, tombs, and palaces. The street called Straight still exists today, with two partially preserved Roman gates remaining. On Paul’s first missionary journey, he and Barnabas went to Lystra. There Paul healed a man who had been crippled since birth. When the local people saw the power that the two Apostles possessed, they hailed them as gods. They called Barnabas Zeus, the chief of the Greek gods, and Paul Hermes, the herald or spokesman for the gods. (Some Bible translations use the Roman equivalents﻿—Jupiter and Mercury.) The priest of Zeus arrived with “oxen and garlands,” intending, according to the local custom, to offer sacrifices to the two Apostles. Only their urgent disclaimers dissuaded the worshipers. One early convert in Lystra was Timothy, who became Paul’s faithful companion in later missions. Today Lystra, in the south-central part of the Republic of Turkey, is a ruin with few remains. In various locations in the Mediterranean world, stone reliefs have been discovered depicting oxen draped with garlands in preparation for sacrifice. 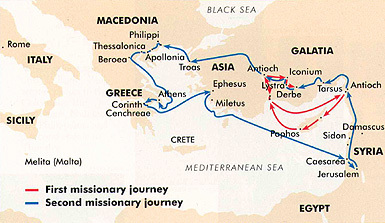 On Paul’s second missionary journey, he and his companions﻿—Timothy, Silas, and Luke (see Acts 16:1–25)﻿—were directed by revelation to cross the Aegean Sea and take the gospel to Macedonia﻿—northern Greece. Their first major stop in Macedonia was at Philippi. While there, Paul drove an evil spirit out of a young woman whose masters had profited from her fortune-telling. When they saw that Paul had ruined their business, they took him and Silas to court and charged them as troublemakers. The two missionaries were whipped and imprisoned. At night an earthquake opened the prison door and loosed their bands. But rather than escaping, Paul and Silas taught the gospel to their jailer, converting him and his family. The next morning they were released. Paul loved his Philippian converts deeply. Years later he wrote to them, expressing his affection and his desire that they remain faithful in the gospel. Corinth was an important city on the coast of Greece, strategically located and prosperous. It was dominated by its acropolis (the upper city) on a mountain next to the city and by the ancient temple of Apollo in the city’s center. 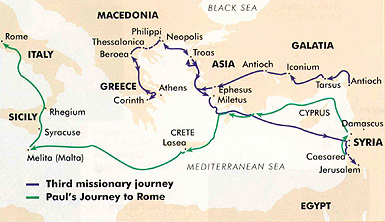 Paul came to Corinth on his second missionary journey and stayed there for one and one-half years. The book of Acts records that some of Paul’s Jewish opponents brought him to the judgment seat to have him tried as a civic menace. The Roman governor had no interest in the matter and dismissed the case. Archaeologists have discovered a public podium at the agora, and some have suggested that this site may be the location where Paul’s trial took place. After leaving his converts in Corinth, Paul stayed in touch with them. The New Testament preserves two letters he wrote to them during his third missionary journey. Ephesus was a prosperous center of commerce, culture, and religion. Much of its wealth came from its location on the Aegean coast at the end of major trade routes from the Near East. But Ephesus also achieved both fame and wealth because it was the center for the worship of the goddess Artemis (identified with the Roman Diana in some Bible translations). The temple of Artemis in Ephesus was considered the most beautiful of the seven wonders of the ancient world. About 360 feet long and 170 feet wide, it was one of the largest and best-known buildings in the Roman Empire. Paul stayed in Ephesus for two years on his third missionary journey, preaching the gospel and directing the missionary activities of others throughout the province of Asia. Although he and his companions had tremendous success in Ephesus, they experienced opposition from silversmiths who made shrines for the worship of Artemis. The silversmiths started a large public demonstration against them, and the mob rushed into the city’s theater, where they demonstrated for hours on behalf of their goddess and against Paul and his fellow workers. Today Ephesus, on the west coast of Turkey, is one of the most fabulous of all ancient ruins. The theater still remains. Enlarged somewhat after Paul’s time, it seats more than 20,000 people. Following centuries of economic decline, earthquakes, and plundering, the once-proud temple of Artemis is now a pile of rocks. But Paul’s message remains and fills the earth with the testimony that he bore﻿—that Jesus is the Christ and that His gospel is the way to salvation for all people. While twice imprisoned in Rome, Paul wrote epistles to the Colossians, the Ephesians, Philemon, the Philippians, and a second epistle to Timothy. Rembrandt, National Gallery of Art. Courtesy of Providence Litho. Gustave Dore. Frederick Shields. Jean Restout; Giraudon/Art Resource, NY. W. G. Simmonds. James Clark. A Roman gateway into the old city of Damascus stands today as a sentinel on “the street which is called Straight,” where the blinded Saul was taken following his divine conversion. The unexcavated mound of Lystra, is all that can be seen of the city where Paul converted Timothy, a future missionary companion. The ruins of Philippi, in northern Greece, include the remains of an agora (marketplace). The main street of Ephesus was flanked by temples, monuments, and luxurious homes. The temple to Artemis, considered the most beautiful of the seven wonders of the ancient world, is now a pile of rubble.